Who needs a tour guide when you have friends like these? Angkor Wat with a little help from the local police. My first glimpse of Angkor Wat came from the back seat of a Cambodian police officer’s motorbike. 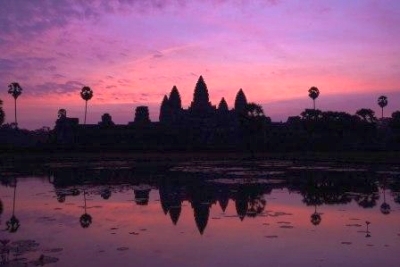 It all started with an early evening arrival in Siem Reap. After checking in to my hotel, I referred to my guidebook which suggested that sunset at Angkor Wat was a visual experience not to be missed. Curiosity piqued, I checked the clock, noted the dying sun and decided to quickly walk the five kilometers from my hotel to the temples. It soon became clear that walking the distance was not the safest idea for a woman traveling alone. Beyond Siem Reap’s city limits, the road turns gritty. Overgrown vegetation, dense banyan trees, and the flickering light of squatters’ campfires replace the shiny veneer of the tourist capital. I picked up my pace and made the mental note to find a tuk-tuk for the return trip back to town. I froze in my tracks, heart pounding in my chest. I knew Cambodia had corrupt officials and I was wary of him in my vulnerable state, but after a quick study of his starched uniform, closely buzzed hair, and militant demeanor, I thought to myself, “Yeah, he’s for real.” My mind began racing to think what I could possibly have done wrong. Was it my clothes? The fact I was alone? I didn’t litter, did I? Baffled, I wondered if I was about to set a tourist record for the shortest duration in a country before getting arrested. And for what, I had no idea. “Do you have a day pass?” He barked at me. “You need a day pass,” he commanded. Clearly I wasn’t going to win this argument. I sighed and hurried back to the ticket booth. Once I had the requisite day pass in hand, I continued my trek to Angkor Wat, resigned that I was likely to miss the sunset. All of a sudden, the roar of an engine came up behind me. I turned around to see the same Cambodian police officer on his motorbike. “What now?” I thought. “Get on,” he said, pointing to the back of the bike. “I will drive you to the temple.” He must have seen my hesitation because he smiled at me and said reassuringly, “I know you are late now. I am sorry. Please let me help you get to the temple quickly.” Something in his eyes told me that I could trust him. I got on the back of his bike and we sped away down the bumpy road. When we arrived, I slowly got off the motorbike, transfixed by the landscape in front of me. The setting sun glanced off the thousands of dust particles hanging in the humid air to illuminate the sky a vivid crimson that reflected in the still waters of Angkor’s moat. The famous spires of the vast temple wound proudly up to into the heavens. Hundreds of locals and tourists mixed with monks in burnt orange robes, all harmoniously situated along the entry’s ancient stones. A sense of peace and calm resonated throughout. No one spoke above a whisper as we witnessed the vibrant sunset dim into the soft purple tones of early evening, serving as dramatic backdrop to Angkor’s majestic silhouette. I stood for awhile in front of the complex after that considering the poetry of the architect’s vision. As I looked out on the scene before me, I was left convinced that Angkor Wat has to be one of the world’s most beautiful man-made places. I was so glad that I was able to enjoy it at this magical hour. “He is a police officer, you can trust him,” I told myself all the while calculating the least painful way of jumping off the bike if I had to. True to his word, our path opened to beautiful country with cropland and tiny wooden houses scattered throughout. He stopped a few times, pointing out where he thought I might like to take pictures. He was as proud of this place as I was curious to see it. I soon relaxed and enjoyed the rest of the scenic ride that my impromptu tour guide gave me back into town. I reflected on his words. “I sure hope so,” I thought to myself. Paige Stringer is a Seattle-based travel writer. View more of her work and her photos at www.PaigeStringer.com.